Melbourne is located approximately 60 miles (97 km) southeast of Orlando on the Space Coast, along Interstate 95. It is approximately midway betweenJacksonville and Miami. According to the United States Census Bureau, the city has a total area of 39.6 square miles (102.5 km2), of which 33.9 square miles (87.7 km2) is land and 5.7 square miles (14.8 km2) (14.42%) is water. 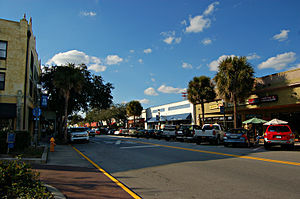 The east-west street named Brevard Drive was historically the "center" of town; with addresses called "north" and "south" of this street. The north-south Babcock Street provided the same centerline for "east" and "west" directions. Melbourne Beachside has a small presence on the South Beaches barrier island. It is often confused with Melbourne Beach, a separate political entity.